I purchased the little homemade step stool at a thrift shop the other day. Since my laundry room is next to my kitchen, it serves as a combination pantry/laundry room. This is the before photo of the stool It had tons of real distressing and paint drips, etc. but I hated the shiny gloss enamel paint patina so I decided to paint it. I brushed on two coats of Annie Sloan Chalk Paint in Country Grey, which is actually a tan. 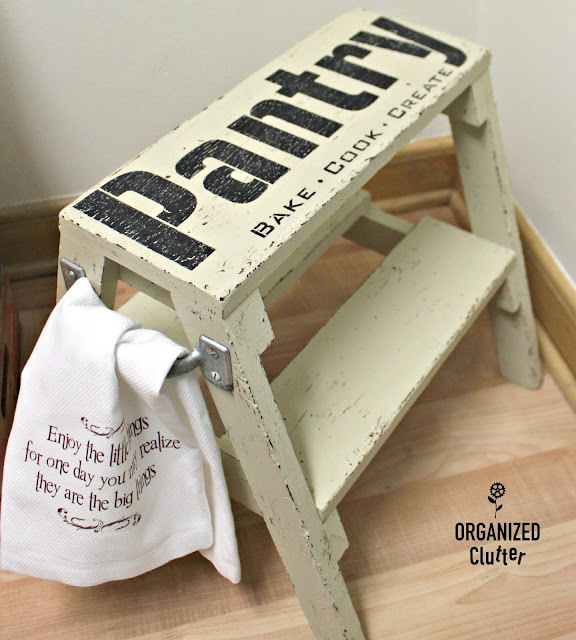 *The Old Sign Stencils "Pantry" stencil fits the top step of my stool. 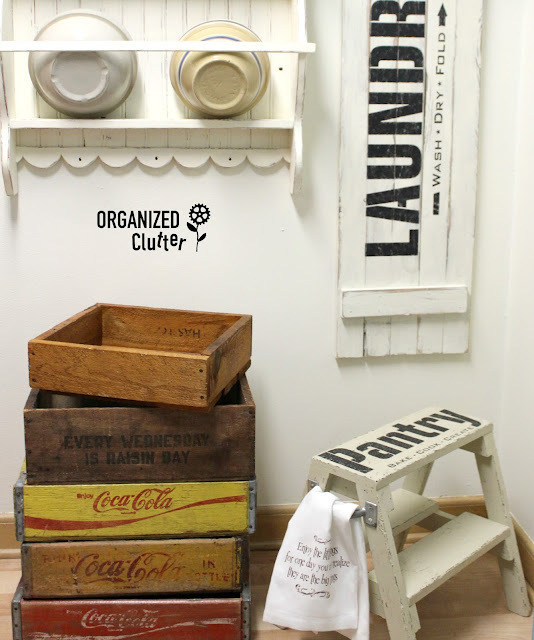 If you haven't visited the Old Sign Stencils website, be sure to click the link and check out all of Funky Junk Interiors' rustic stencils. Here is the stenciled stool. I hate to distress with sand paper when there may be lead paint on the piece. Here I very lightly sanded the lettering but not through the chalk paint. I also wear a dust mask when distressing with sandpaper. 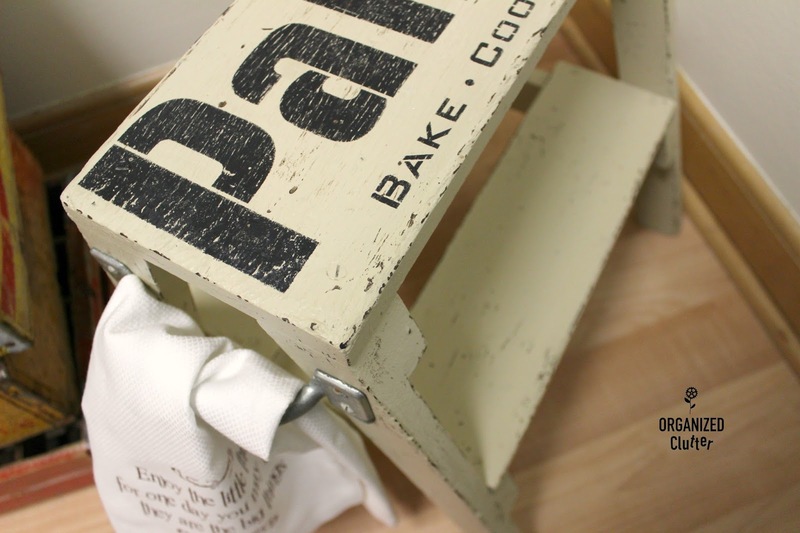 To give the stool a distressed finish, I pulled out the Plaid Layering Block and Ceramcoat Walnut Noyer craft paint and distressed the edges and also the other surfaces. I still haven't done a video on how to use the Layering Block but it's isn't that hard. I use a sponge brush to paint a thin coat of Walnut Noyer craft paint on the block and slide it along the edges. For the middle surfaces, I rub the block on a newspaper until almost ALL of the paint is gone, and then slide it over the center. If you mess up, (and I have) I just touch the base color up. When fully distressed, I coated the stool with water based matte sealer. I added an industrial drawer handle for a towel or to easily carry the stool from room to room. The stool looks distressed to me! 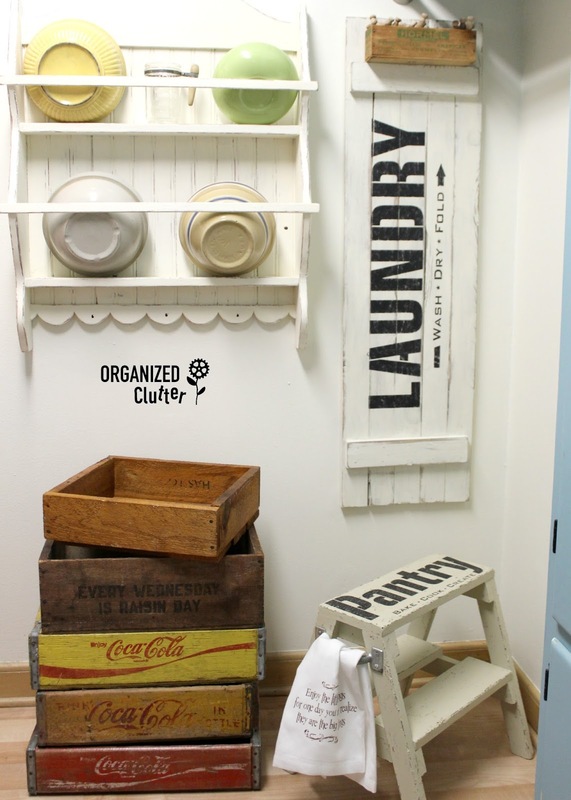 Stencils can add FUN and INTEREST to your farmhouse! The Laundry sign stencil is available here. Love the stool Carlene and the makeover. I hope to build one like. Thanks for the inspiration. What an improvement on the stool now! Like the stencil too! Especially love the handle you added! What an idea! I love the stool! And, I sure could use it!!! The Laundry sign is adorable Carlene!! !